For obvious reasons, weddings play a sizable role in romance novels. It's often a challenge, however, to discover exactly what historical brides wore on their wedding day. As Loretta and I have written before (here and here), white was by no means the universal choice before Queen Victoria popularized it, nor did most brides wear a designated, one-time-only wedding gown. 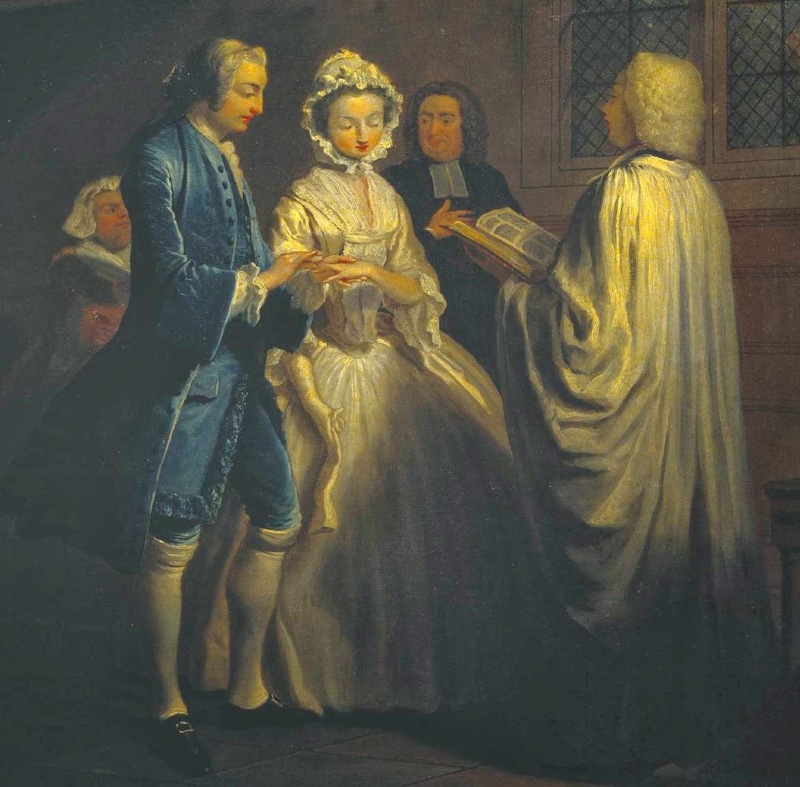 Even wealthy brides often wore new gowns that would become their "best" dress after they were married, and contemporary descriptions of weddings seldom portray the bride's attire in the kind of detail modern readers expect. No, we intrepid Nerdy History Girls must seize the random wedding dresses wherever we find them. In yesterday's post, Loretta discovered a wonderful description from 1817 of Lady Caroline Paget's wedding attire tucked into La Belle Assemblee's listings of Marriages, Births, & Deaths. The description, right and transcribed below, of what a bride wore in 1763, is equally detailed, but much more melancholy. It comes from The Annual Register, a reference work first published in London in 1758 to catalogue each year's major events and trends, and continues to be published today. The 18th c. listings are a bit arbitrary - on the same page as this entry are others that feature a pair of fruit trees blooming out of season and proceedings of the Irish House of Commons – and often include just enough information to tantalize rather than inform. I'm guessing this story was included for its tragic quality, but it leaves me wondering not only the identity of the poor married lady but also the cause of her untimely death. A young married lady, who died a few days since, was, at her own request, buried in all her wedding garments, consisting of a white negligee* and petticoats which were quilted into a mattrass, pillows, and lining to her coffin; her wedding shift was her winding sheet, with a fine point lace tucker, handkerchief, ruffles, and apron; also a fine point lace lappet headdress, and a handkerchief tied closely over it, with diamond ear rings in her ears, and rings on her fingers, a very fine necklace, white silk stockings, silver spangled shoes, and stone buckles. *A negligee at this time is a style of informal day dress, not a fancy nightgown. Don't be surprised if some of this turns up on my next fictional bride – though I promise she will have a much longer happily-ever-after. Many thanks to J.DiPlacidi (@gothic_desires on Twitter) for first sharing this entry. Top: Detail, IX: Pamela is Married, by Joseph Highmore, 1743-4. Tate Britain. 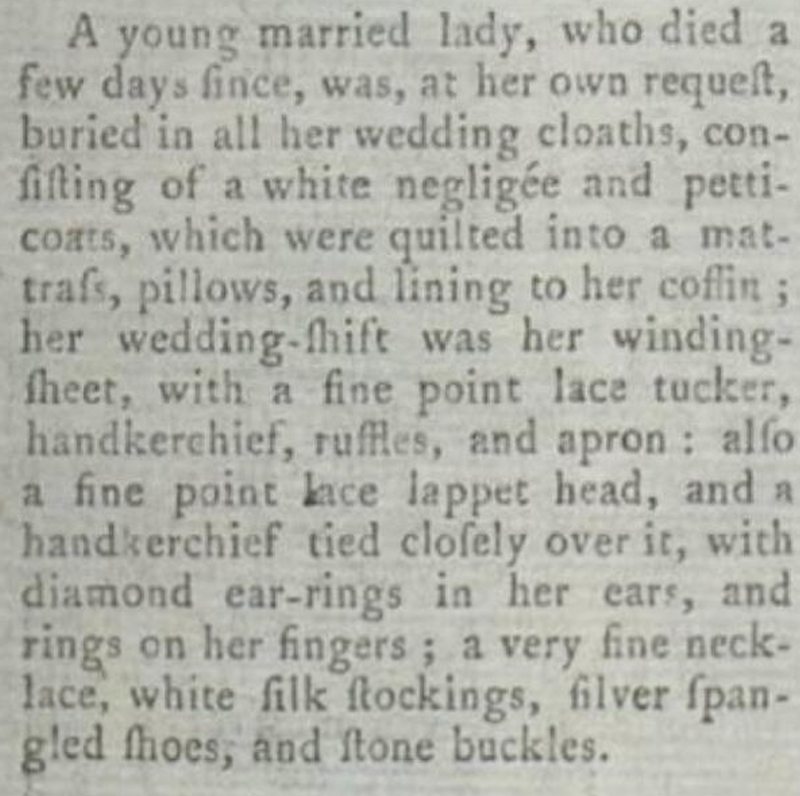 Bottom: "A young married lady...." from The Annual Register, 1763. Sad, but very interesting! What a great find.